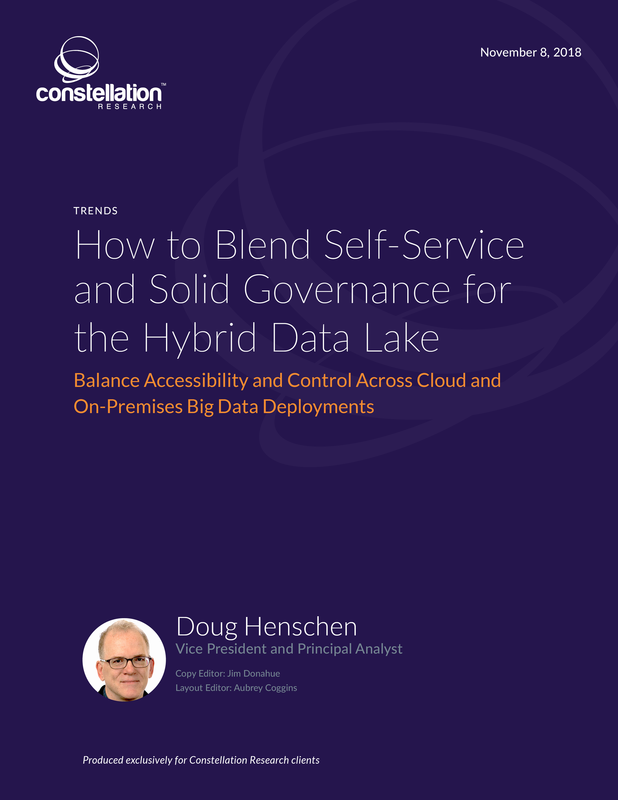 How to Blend Self-Service and Solid Governance for the Hybrid Data Lake | Constellation Research Inc. Leading organizations pursuing digital transformation are turning to big data and cloud deployments to drive agile development and innovation. Data lakes, Internet of Things initiatives, artificial intelligence and machine learning experiments as well as self-service analytics programs are all moving into the cloud. Yet even the most aggressive companies that are “all in” on the cloud often choose to retain certain data and related assets on-premises because of privacy or other regulatory requirements. Trust is a core concern in any data initiative, yet governance and assurance of compliance have never been more challenging now that organizations have data and assets spread across the cloud and on-premises data centers. This report explains how organizations can deliver fast and business-user-friendly self-service access to information while also ensuring proper data governance. It discusses data catalogs, which are proliferating because they ease the data-access problem for business users. But as this report explains, catalogs must include or tightly integrate with data-lineage tracking, data glossaries and broader data-governance capabilities. What’s more, organizations must address the people and process aspects of data governance to ensure user adoption and trustworthy information.